Not many plants and herbs managed to capture the hearts of people around the globe as well as sage. Used for centuries for its aromatic savory taste and medicinal properties, sage first conquered the Mediterranean region and gradually found its place in homes around the world. The plant’s scientific name already says a lot – Salvia, which translates from Latin as ‘to be saved’ or ‘to cure’. Research shows that sage can alter a person’s cognitive abilities and might have a potential in treating neurological disorders such as Alzheimer’s disease. This confirms the age-old wisdom, and the philosophies of Chinese medicine and Ayurveda. A study from the Universities of Newcastle and Northumbria compared sage to a placebo in relation to cognition. Participants taking capsules that contained sage oil performed significantly better on a word recall test compared to the group taking placebo. Further reading: read my articles The Best Herbs to Improve Memory and Brain Function. Some exciting developments are also under way in the area of Alzheimer’s research. A clinical trial published in the Journal of Clinical Pharmacology and Therapeutics showed that patients with mild to moderate forms of the disease improved their cognitive skills and experienced less agitation after taking sage for four months. Scientists explain that sage’s positive effects on the brain probably have to do with a combination of chemicals that also inhibit an enzyme called acetylcholinesterase (AChE), which disturbs neurotransmitters’ function in patients with Alzheimer’s. Further studies are expected to establish how sage could contribute to the development of Alzheimer’s medications, which currently cause a lot of unwanted side effects. Further reading: Top 5 Foods and Supplements to Delay Alzheimer’s Disease and Dementia. Medical studies found that sage contains many anti-inflammatory and antioxidant compounds. It has been suggested that people who suffer from inflammatory conditions, including arthritis and asthma, should increase their sage intake. Like rosemary, sage too contains rosmarinic acid, which gets easily absorbed and controls the body’s inflammatory response. In conjunction with that, the plant’s leaves and stem also abound in antioxidant enzymes, which prevent oxidative stress that can result in many chronic diseases, including cancer. Some animal studies showed that sage’s antioxidants can support liver health. When sage tea was given instead of water, antioxidant levels in the liver increased, as reported in the study published in the Journal of Ethnopharmacology in 2005. In addition, another study found that sage prevented depletion of glutathione, an important liver antioxidant, by 62% in the studied animals. There is a lack of human studies, however, and some warn of the sage’s unclear effect on the liver. A study from 2007, published in Food and Chemical Toxicology, reported that sage tea may increase the carbon tetrachloride-mediated toxicity of the liver in laboratory animals, which could be potentially dangerous. Therefore, the use of sage tea for liver health should always be consulted with a doctor to establish the safety of taking it. Sage has been shown to reduce blood glucose levels and cholesterol. Again, studies were mostly done on laboratory animals and showed that sage extract blocked the release of stored glucose from the liver thus lowering the animals’ blood glucose levels. When the Mediterranean herb was compared to a common diabetes drug, metformin, it emerged that sage could play an important role in the prevention of type 2 diabetes. More human studies are required, but a small human trial published in Complimentary Theories in Medicine did show that sage also reduced fasting glucose levels in patients with diabetes. Due to the herbs propensity to reduce blood sugar, you should consult your doctor if you are a diabetic and want to take it as a supplement. Further reading: read my articles The 13 Best Foods to Control Type 2 Diabetes, Top 10 Spices and Herbs for Type 2 Diabetes and 7 Effective Steps to Prevent Type 2 Diabetes. Sage can help with some of the annoyances menopause brings. According to research, tea made from dried sage leaves, is particularly effective with hot flashes. Women are advised to drink it at the onset of a hot flash, as well as a preventative measure. One serving can reduce the frequency and intensity of flashes for up to two days. In 2011, a study was published in the journal Advances in Therapy, which showed that hot flashes significantly reduced in post-menopausal women after taking sage leaf supplement. After 4 weeks, the flashes reduced by 50%, and they dropped by 64% after 8 weeks, with some of the strongest ones disappearing completely. Further reading: Learn how to make sage and raspberry leaf tea for hot flashes and night sweats. Sage can also improve your mental well-being. When volunteers took either sage leaf extract or a placebo sugar pill, a significant difference was recorded between the two groups when taking a stress-stimulation test. Those taking sage had improved mood prior to the test, and if taking a 600 milligram dose, this improved the participants’ alertness and calmness and decreased anxiety levels throughout the test. To make sure sage doesn’t interact with your existing medication or have a negative effect on you, you should always consult your doctor if you have a health condition and you are considering taking sage supplement. Due to sage containing a chemical called thujone, it shouldn’t be taken by pregnant and breastfeeding women. In large doses, thujone can be toxic and cause a miscarriage, as well as reduce milk supply. People who have diabetes should carefully monitor their sugar levels. Spanish salvia, a species of sage, should not be taken if you have a condition that can be made worse by exposure to estrogen hormone, or you have either high or low blood pressure. 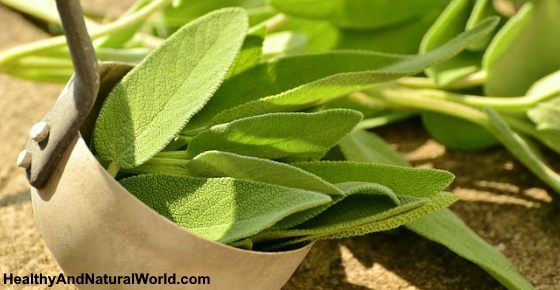 Sage should not be used before a surgery, as it might interfere with blood sugar control. Don’t take sage if you suffer from seizures – the chemical thujone can trigger an episode. Sage is available as a fresh or dries herb, liquid tincture, an extract, capsules, essential oil and tea. Some sources recommend to consult your doctor before you decide to begin drinking sage tea on a regular basis, as the amount of sage tea you need to drink daily may depend on your health, age or weight. It is recommended to prepare sage tea by steeping 1 to 3 g of dried sage in 1 cup of boiling water, and adults can consume up to 3 cups of this medicinal tea each day, according to the University of Pittsburgh Medical Center. WebMD website mentions that for treating Alzheimer’s disease dosage is 1 gram of sage per day. It also mentions that a dose of sage extract, gradually increased over time to 2.5 mg three times daily, has also been used. Sage is also a common ingredient in natural toothpaste due to its excellent antiseptic and antibacterial properties, and is known to treat oral infections, gingivitis and sore gums. You can use sage for treating gum infection. J Tradit Complement Med. 2014 Apr-Jun; 4(2): 82–88. Pharmacol Biochem Behav. 2003 Jun;75(3):669-74. Drugs R D. 2017 Mar; 17(1): 53–64. Curr Neuropharmacol. 2013 May; 11(3): 315–335. Evid Based Complement Alternat Med. 2016; 2016: 7178105. Complement Ther Med. 2013 Oct;21(5):441-6. doi: 10.1016/j.ctim.2013.07.004. Epub 2013 Aug 6. J Ethnopharmacol. 2005 Feb 28;97(2):383-9. Epub 2005 Jan 17. Mutagenesis. 2016 Jan;31(1):51-9. doi: 10.1093/mutage/gev056. Epub 2015 Aug 21. Adv Ther. 2011 Jun;28(6):490-500. doi: 10.1007/s12325-011-0027-z. Epub 2011 May 16.